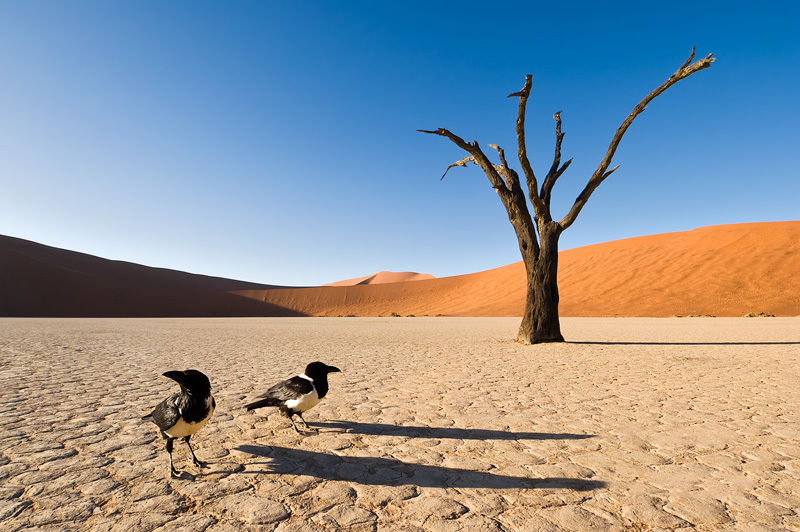 This was shot many years ago, when Namibia was still undiscovered. On one of the mornings I was setting up my camera when I saw one of these pied crows pecking my water bottle. It's objective was to make it topple over, which it eventually did. The crow then quickly moved towards the cap, as if it was ready to drink straight from the bottle. But the bottle was closed, so no water came out. That's when I realized that I could use this to my advantage. I poured some water into the cap and placed it in front of my wide angle lens. After a while the crows appeared right where I wanted them.